The biggest thrill is reaching out to an author, asking them to stop by for a visit and having them say “yes”. When I was working on my Recommendations page a few months ago Molly’s book caught my eye. It could have been the cat on the cover or the crafter in my heart or my love of cozy mysteries. The one thing I knew for sure was that I wanted her to drop by here for a visit. I was chair dancing when she said YES! Please help me Welcome Molly MacRae! And help yourself to a glass of Rosemary Watermelon Lemonade. (The recipe can be found in the back of Last Wool and Testament ). I like small things. I’m not all that big myself. And ever since learning about microcosms in a long-ago high school English class, I’ve liked them, too. Hearing the definition – a larger world or society illustrated in the form of a small world – flipped a light bulb on for me. That world-made-small construction is exactly what I love about stories and it’s probably why I gravitate toward small-town mysteries. Small-town mysteries give us the world in a compact package. We learn our way around that world and confront it or stumble through it as the story unfolds. Small-town mysteries make the world navigable. They make it cozy. There are lots of examples of microcosms in the bigger world of literature – Ahab’s ship, that wretched island in Lord of the Flies. Jane Marple would probably agree that St. Mary Mead is a microcosm. One of my favorite microcosms, though, is from childhood reading. It’s that house where “Sally and I” are sitting on that cold, cold, wet day when the Cat in the Hat comes calling. Talk about the excitement and danger of the big world knocking on our door! The Cat in the Hat, told in a story that uses only 236 distinct words, is a classic struggle between the forces of chaos and the strength of goodness and doing what’s right. Actually, that little house is more of a nano-cosm, but you get the idea. Microcosms make great playgrounds for writers. It’s fun creating characters and putting them in uncomfortable shoes and even less comfortable situations, building shops and houses and furnishing them either well or outrageously, sampling everything in the bakery without gaining an ounce, publishing newspapers and building roads – and doing all of that with the magical taps of a keyboard. So cool! Blue Plum, Tennessee, is my new play area. To build it, I grabbed my favorite bits and pieces – including people – from small towns I’ve known and lived in, and I trucked them to the northeastern corner of the state. There I assembled everything in a low valley nestled in the foothills of the Blue Ridge Mountains. It seems to be working out pretty well, too. Blue Plum is a swell little town. The characters are settling in nicely and making it their own. 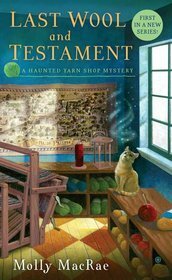 You’ll find Blue Plum in my new Haunted Yarn Shop mysteries, starting with Last Wool and Testament (just out!) And if you’re on Pinterest, look me up. I put together some boards that might give you a photographic inkling of that small corner of the world. The boards are a work in progress, but the mountains are there and views of Main Street, the courthouse, Mel’s café, the Weaver’s Cat, the little house on Lavender Street that Kath inherited from Ivy, and the cemetery where Ivy is buried. Mel’s bakery case is there, too. Try not to drool. Molly MacRae spent twenty years in the foothills of the Blue Ridge Mountains of Upper East Tennessee, where she managed The Book Place, an independent bookstore; may it rest in peace. Her short stories have appeared in Alfred Hitchcock Mystery Magazine for more than twenty years, and she has won the Sherwood Anderson Award for Short Fiction. Find Molly on Pinterest here. Her Boards are so cool!!! TGIF – Thank Goodness It’s Fiber! That’s the the name of a group of fiber and needlework artists founded by Kath Rutledge’s grandmother Ivy. Sadly Ivy just recently passed away and Kath has come home to Blue Plum, Tennessee to see to decide what to do with her grandmother’s shop, The Weaver’s Cat, and settle all her other affairs. Little did she know that her grandmother was the prime suspect in a recent murder. Kath needs to clear Ivy’s name and she has a help from a very surprising specter. Seems the ghost has just as much interest in solving the murder as Kath. So with her spirit sidekick and the members of TGIF Kath “sets out to unravel the clues and hook the real killer”. The residents of Blue Plum are so much fun, even the ones everybody can’t see! In fact Geneva was my favorite character. Kath had quite a time with her and I loved every minute. She starts out very gloomy and depressed but by the end she is oh so happy. Well as happy as a ghost can be. This was a complex mystery and I thought I had it all figured out but I was wrong. From Kath’s speeding home as quickly as possible to get to the funeral until the final clue is unraveled the pages just keep turning. Molly MacRae has woven together a smart and witty whodunit for all of us to love. This is a wonderful debut!!! I have 2 copies of the awesome book to giveaway!! Leave a comment for Molly for 5 Bonus Entries ! Molly, This sounds like a great book and I cannot wait to read. Being a small town girl I love stories placed in small towns. Thank you, Pamela. I’m a small town girl, too, although I’ve lived in a few city neighborhoods that have that cozy, small town feel. I love cozies with the small town atmosphere- this sounds like a great book. I’m looking forward to reading it. Thanks, Amanda. I hope you like it! I love the book! I am glad for the chance to enter for a copy. Do you still visit the Blue Ridge Mountains? I bet you like Southern foods? What’s the favorite dish you make? I follow your Pinterest page. It is very interesting. Thank you again for the visit with me, a Reader of Dolly’s Blog. Hi, Cyndee! Thanks for stopping and thanks for the kind words about the book. We don’t get back to Tennessee often enough. I hope to go back next summer, though. I never learned to cook with a particularly Southern flair, but I do love a good Carolina pulled pork sandwich with cole slaw. How about you? I love the title of your cozy. I also love the name of the place, Blue Plum, Tennessee. Thanks for coming here. Also, thank you Dollycas. I don’t blame you for doing a chair dance. Thank you, Hattie! The town now called Johnson City in Tennessee was once upon a time called Blue Plum. They left it behind so I grabbed it. I haven’t visited Tennessee, so I’m looking forward to visiting Blue Plum. Locations & characters are the parts I love most in cozies, besides the mystery. I love the small town atmosphere where everybody knows everybody’s business. Northeast Tennessee is a great place for a vacation, Barbara. It’s got something for everyone, from history buffs to hikers to theater goers to NASCAR fans to river rafters. And mountains and bears! This looks like the start of a wonderful series…I’m a needlework and yarn crafters and cozy mystery lover, so this looks like it will be my type of book! Wonderful, Mary – I hope you get a chance to read and that you love it! Good luck, Karen! I like lots of mysteries, but I always come back to cozies. Glad you like the cat, Ashley. He looks very much like my own. What a perfect title. And a cat. And a mystery. Sounds great. I had fun coming up with the title, Sheila. Glad you like it. I’d love to win the book as the library doesn’t have it. I already knew about the book before this giveaway. I like yarn but I don’t knit or crochet. I love cats too. Sounds like a great book. Hi, Molly—I love cozies and would love to read yours—wishing you great good luck with the book! Nice post. The book sounds intriguing. A great title so I am sure the book is great. Can’t wait to read it. I do have fun with titles, Nancy. The next in the series is Dyeing Wishes and the third (still tentative) is Spinning in Her Grave. I’m not a writer so your “miniature world building” is fascinating! Thanks for an inside look into your processes. I’m looking forward to your new book/series. And I may even get out my crochet hooks! Excellent, Karen! Thanks for stopping by. Oh, Ann, I tried to get the hang of knitting for years (and years). I think last year it finally took. Amazing! This sounds like a wonderful new cozy series! I’d love to read this. I used to visit small Tennessee towns back in the 50s and 60s so this might feel like going home. It sounds terrific. I love the cover….the cat is so cute. Hi Linda, I hope you get a chance to read the book and that it takes you home again. Thanks for stopping by. I like the name of the yarn shop—I just hope it’s not too haunted. I enjoy mysteries and needlecrafts. This book seems like a perfect match for me and I am eager to read it. Thank you for the marvelous giveaway. Love the ‘Cozy’s’, thank you for hosting the giveaway. A great mystery is what a LOVE to read! Book looks wonderful.Definetely another one to be added to the TBR List. love the wallpaper, since it’s getting colder here. books are MY escape from my boring life.